‘France has voted like it never did before’, was the headline of Spiegel Online on Monday morning, and many other foreign observers expressed similar views on the manner in which the traditional parties of the Left and Right were kicked out of the competition by an overwhelming desire of renewal of the political class. The old new fault line. But once the dust has settled on this shake-up and on the performance of Emmanuel Macron, who may well be the most surprising shooting star French politics has ever seen, it will become clear that the basic voting patterns of the French electorate have hardly changed at all over the last quarter of a century. It suffices to compare the map below published by Le Monde yesterday with the maps of the referendum on the Maastricht Treaty in September 1992 and the referendum on the European Constitutional treaty in April 2005. In an excellent post-referendum booklet named ‘The Day France said No’, edited by the Jean Jaurès Foundation and published by Plon (2005), demographer Hervé Le Bras (see his 2017 analysis here, published yesterday on the nouvelobs site) very convincingly demonstrated to what extent ‘The memory of the territories’ determined electoral behaviour over time. 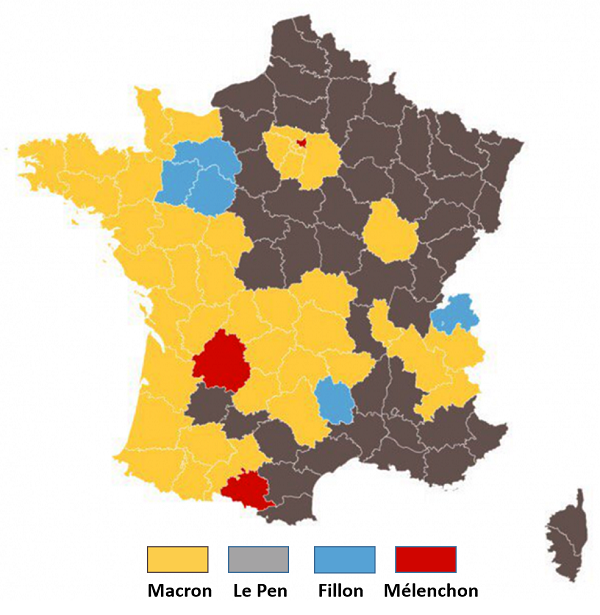 And Sunday’s first election round is a compelling confirmation of his findings, despite the undeniable progress of the Front National in the North, the South and the East, including the Alsatian region (though not in the urban centres Strasbourg and Colmar). Which provides once again striking evidence for the thesis that the deepest fault line across French society is the one between what Christophe Guilluy famously named ‘peripheral’ France and what I would (less famously) call ‘participating’ France, a dichotomy which is not exactly synonymous to ‘rural’ and ‘urban’, but which is in certain ways well rendered by the maps above. 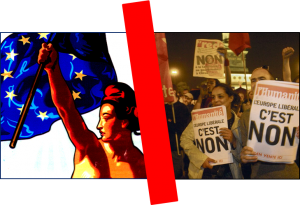 It’s the dichotomy of openmindedness and opportunity-seeking as opposed to the withdrawn, reproachful, self-fulfilling pessimism that the French themselves sum up in the well-known sigh ‘Tout fout le camp!’ (‘Everything’s going down the drain’). If it did not sound so simplistic, I would simply refer to it, beyond economic indicators, as ‘happy’ and ‘unhappy’ France. And the most dividing issue, the one which crystallises it all, is … Europe, and everything that it stands for: globalisation and free markets, open borders and multiple cultures, shared sovereignty and common currency. Grossly simplified, last Sunday’s results suggest that half of the French population – the 50% who voted for Macron, Fillon and Hamon – is pro-European, with considerable variations in enthusiasm – and the other half of the electorate (including extreme right, extreme left, and fringe candidates) is resolutely against the European Union, even if their motives and the manner in which they voice their discontent vary. What is new and different, however, is the explicit salience of the old fault line. Emmanuel Macron took three major symbolic risks in his fundamental ideological layout of the En marche! movement. Not only did he decide to be resolutely positive and optimistic in a country haunted by pessimism, but he also boldly set out to give the adjective ‘libéral’ a new meaning outside the semantic dogmas of the Socialist Party. And last but not least, he was unapologetic about being enthusiastically European, bringing together his personal conviction and the firm belief, as MEP Sylvie Goulard pointed out to Politico, that a rather silent majority of French citizens were profoundly attached to the ‘acquis communautaire’ of cooperation and friendship, especially with Germany. Emmanuel Macron in Nantes, 19 April. In marketing terms, European enthusiasm was Macron’s ‘unique selling point’ – and what seemed to be a niche market has turned out to be a rather large, untapped market share, whose potential was reinforced by the lucky circumstance of having the likes of Farage, Trump, Wilders, Putin and Erdogan reminding everybody in a timely manner that the EU may actually be worth defending. 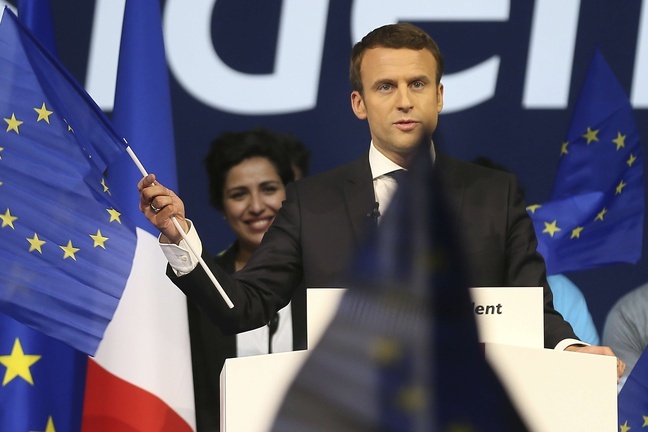 Surprisingly, Macron even managed to underpin his pro-EU arguments with a symbolic renewal. 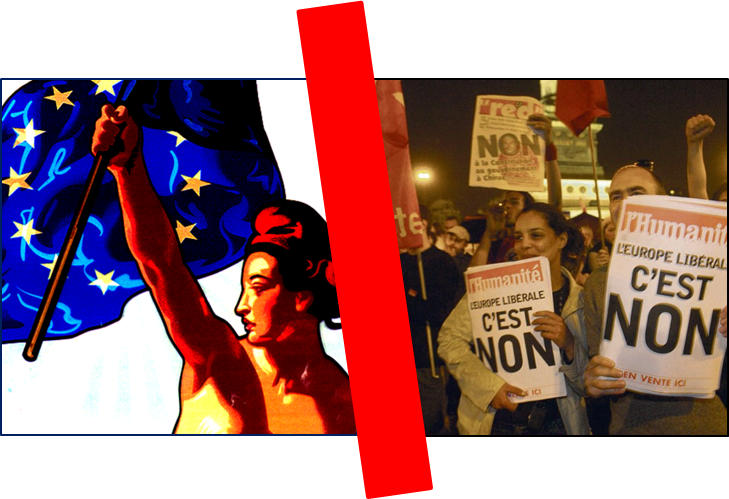 Following Le Pen’s demand of removing the European flag – tenderly nick-named ‘your oligarchic rag’ by the FN’s No. 2, Florian Philippot – for a television interview, he turned his rally in Nantes into a genuine profession of faith, waving the European flag and having the audience sing the Ode to Joy. Totally surrealistic for everyone who has followed the political debate in France since … 1992. The post-election TV debates on Sunday evening already foreshadowed that Europe and the Euro will be used by both remaining candidates as one of the major ‘key differentiators’ over the next two weeks. It will no doubt also be one of the central issues of the television showdown scheduled for 3 May. Needless to say: whatever the result of the second round of the presidential election and the looming legislative elections, the fault line will remain. The polarisation of society has not yet reached American levels, but it will take a person of outstanding negotiating and compromising skills to bridge this deep divide. European leaders – most of all the next German government – would be well advised to help Macron make European integration (and everything that it stands for) acceptable again to the 50% of the French population who have so vigourously voted against it last Sunday and who have been hardened in their opposition by the insistent rhetoric of the populists and the efficient frustration machine that the Fifth Republic has become. This is post # 19 on the French 2017 election marathon. All previous posts can be found here. France 2017: Just do it! This entry was posted in Current Affairs, Democracy & Citizenship, Global & International, Politics & Public Policy, Society & Culture, The EU and tagged Emmanuel Macron, European integration, European Union, France 2017, Marine Le Pen, symbols. Bookmark the permalink.